It would be an exaggeration to say we moved halfway around the world for tomatoes, but it actually isn’t as farfetched as you might think. You see, although tomatoes – on the surface – may not seem nearly as important to quality of life as, say, annual sunshine hours or the affordability of healthcare, I challenge you to live without any good ones for seven years and tell me how the quality of your life fares. There were many things that endeared me to Scotland – the whisky, the haggis, the quirky new vocabulary – but Scottish tomatoes were definitely not on that list. Simply put, they sucked. Well, I should say that the tomatoes Scotland imported sucked, since I never did actually run across a Scottish-grown specimen. I could never understand why the ones they imported were so bad, though, since Scotland doesn’t have a climate for growing nectarines and figs and eggplant either, yet each summertime the greengrocers’ shelves were bursting with ripe, reasonably tasty imports from places like Turkey, Spain, Italy, and France. You wouldn’t think it would be so hard for those exporters to just toss a few bushels of tomatoes on top too, would you? Well, for whatever reason, they don’t, and apart from a few insipid, watery batches trucked up from southern England, all the tomatoes I ever bought in Scotland came from Holland, another country not known for its tomato-growing climate. How the Dutch finagled the exclusive contract for supplying northern Europe with tomatoes I may never know, but unfortunately they did; I’ll go so far as to say you’d be hard-pressed to find a tomato north of Brussels that didn’t come from their massive greenhouses, where they grow them year-round and ship them off to even grayer, chillier places where people are apparently ready to buy anything that brings a bit of color to their sandwiches. Because that’s the thing – they look fine, all the picture-perfect deep red beefsteaks, plump little cherries and heavy, smooth-skinned ‘on the vine’ clusters, but all it takes is one bite to realize how no amount of plastic sheeting can make up for the one thing you need to grow a really good tomato: sun, and plenty of it. Still, I know what you’re thinking. If tomatoes were really that important to me I probably should have moved somewhere sunny like southern Italy, or maybe Mexico, and not to a place that has as much reputation for rain as the country I just left. Well, maybe someday I will, but for now, at least the Pacific Northwest offers something that Scotland doesn’t – real summers, which, though brief, are just long and warm enough to coax out of the ground some of the sweetest, meatiest, most delicious tomatoes around. The kind of tomatoes that slice like butter and drip crimson juices down your fingers. The kind of tomatoes you can eat for breakfast, lunch, dinner and dessert and still be hungry for more. The kind of tomatoes that, when slow roasted to a toothsome, caramelly sweetness and layered in a crisp tart shell with thick cream and fresh basil, are good enough to make me wonder why on earth I didn’t move here just for them. There’s nothing revolutionary about this tart – it’s just really, really good, and a perfect illustration of how good tomatoes become even better when left to their own devices for a while in a hot oven. I found the recipe in one of my very favorite cookbooks, The Art of the Tart, a charming treatise on tarts both sweet and savory by Irish food writer Tamasin Day-Lewis, sister of the far more famous Daniel. I don’t often find myself attracted to single-subject cookbooks, but this one is an exception – the recipes in this one are so imaginative, and the writing so confident and unpretentious (and the photos so beautiful! ), that I never open it without wanting to rush into the kitchen and start mixing up a crust. Although many of you should still have some good late-season tomatoes to work with, if you don’t, by all means go ahead and substitute an equal weight of high-quality canned plum tomatoes, drained. Just skip the soaking and peeling step, obviously. Trust me, it’ll be much better than any tart made with fresh, not-so-good tomatoes. p.s. The recipe makes a 9-inch (23cm) tart, but seeing as I’m apparently unable to read I grabbed my 11-inch (28cm) pan and didn’t realize the mistake until it was done. In any case, apart from being a bit thin it came out perfectly delicious, so feel free to upsize if all you happen to have is a larger pan. For the tart crust, blend flour and salt in a food processor. Add the butter; using on/off turns, cut in until mixture resembles coarse meal. Add the ice water and cream. Process just until moist clumps form, adding a little more cream if the dough is too dry to stick together. Gather the dough into a ball and flatten it into a disk. Wrap it in plastic and chill at least an hour. Preheat the oven to 375F/190C. Roll out the pastry and fit it into a 9-inch (23cm) tart pan, leaving the excess draping over the edge. Line the bottom of the crust with foil or parchment and fill with dry beans or pie weights. Place the pan on a baking sheet and bake blind for 15 minutes. Remove the weights and bake for an additional 5 minutes. With a sharp knife, trim the crust flush with the top of the pan (trimming after baking prevents shrinkage). Reduce the oven to 300F/150C. Place the tomatoes in a large heatproof bowl and cover them with boiling water. Spike each one with the point of a sharp knife and let sit for about a minute. Drain, then cover briefly with cold water; drain again. Slip the tomatoes out of their skins, slice them in half lengthwise, and scrape out as many of the seeds as you can. Place them cut side up in a single layer in a large roasting pan. Tuck the garlic cloves inside the tomato halves; drizzle with the oil and vinegar and sprinkle with the salt, pepper and sugar. Roast in the oven for about an hour and a half to two hours, or until they’re looking somewhat wrinkly and caramelized around the edges. Arrange the roasted tomatoes in the crust, adding any juices from the roasting pan. Mix together the egg yolks and crème fraîche and roughly tear in the basil leaves. Season lightly with salt and pepper and pour the mixture around the tomatoes. Bake for 30-40 minutes, or until the cream is firm and golden. Let stand for at least ten minutes before serving, then sprinkle with a few fresh basil leaves. I like this tart best with a fresh green salad and a glass of red wine. sounds like a delicious way to showcase those beauties! Kitt, we do have tinned plum tomatoes in Scotland. This post made me laugh, becuase for the most part, you are right! However, there is a lovely shop in the west end of Glasgow that imports toms from all over, which is where I buy them.If you roast baby plum tomatoes however, even the watery ones, they taste beautiful!I want oven roasted tomatoes now! Part of the problem is that good tomatoes don’t travel well, and tomatoes that travel well are not worth transporting. The best are grow-your-own and local farm stands, if you are fortunate to have such things.My favorite use of tomatoes: Lightly toast some rye bread. Cover with a good layer of SHARP cheddar and put in the toaster oven (under broiler) until it melts. Cover with thick slices of good tomato. Eat. Repeat. I am never going to take tomatoes for granted any more 😉 You are so right what a difference the vine ripened ones make! The tart looks delicious. I just bought a bunch of tomatoes from the local farmer’s market, I think this recipe might be in order. I also have a few containers of roasted tomatoes in the freezer so I should be able to make this throughout the winter. YUM. Maybe I’ll be ordering another bushel or two of tomatoes before the season is up! I made a lot of tomato pies this summer, but they were deep and juicy. I love your spin! I wonder if our children will know what a real tomato tastes like. I, myself, often forget when biting in one of those terrible red plastic fruit. Thank you for helping us remember. You know, I understand you completely. I am Greek and I could not live without good tomatoes. But even in Greece it is hard to find good ones nowadays, because farmers use those terrible seeds from Holland. All of our heirloom varieties have gradually disappeared. And yes, the best way to enjoy a good tomato, apart from eating it raw, is to make a nice tomato tart. I have truly missed your posts – – welcome back to the mainland! But I don’t know how you lasted that long without quality tomatoes! Really love post, and really lovely tart! I had a late-season heirloom from a friend’s backyard last week and couldn’t make the taste last long enough — I think I had actually forgotten that tomatoes could be so flavorful. It’s not just Scotland: Years ago I listened to an episode of Garrison Keillor’s Prairie Home Companion where he described poor quality, out-of-season tomatoes as "strip-mined in Texas." That description always stuck with me. Actually, in Scotland they spell it "whisky". Yes, whisky it is. Whiskey is that Irish stuff. When your tomato season is nearing the end, get some green tomatoes for your tart. Here in South Carolina, I like to serve a green tomato pie when the weather begins to cool and fresh local tomatoes are near the end of their season. I mix in a nice ripe one with a green one that has absolutely no red beginning to form.PS: Glad you’re settled and back to blogging! Just discovered your blog- Love it! The tart looks tasty and I can’t wait to read more. Scotland may import lousy tomatoes, but no matter. Your recipe looks lovely. Makes me want to make it the next season. Aren’t tomatoes Heaven On Earth? PS: It might be silly of me to ask, but do you easily find hot peppers, such as Serrrano or Jalapeno, in Scotland? Because if you don’t, well, gee, my heart goes out to you. LOVE your blog. I only wanted a tomato tart recipe and look whet I got…the most fantastic next blog to distract me. I have just also just realised I know you from your Guardian food blog.happy sunday. Would yummy be the right word? The aroma & the taste of the roasted tomatoes with roma tomatoes from Spain, are just unbelievable! I get you completely when you said "sun". It really baffles me that Scotland does not simply source tomatoes from the south of England, where they can be absolutely stunning, but yet someone chooses to get them from abroad, where they have virtually no taste, as you say. I mean, that has to be much cheaper and easier doesn’t it?! Your tart looks divine though and I am pleased you have a plentiful supply of gorgeous rip tomatoes at your disposal. The photograph is lovely too. It’s funny the things you miss when you move to another part of the world – they’re often the things you never would have thought of and completely took for granted. When living in Mexico, mine was Cadbury chocolate. I didn’t even realise I liked it so much but I sure did miss it! 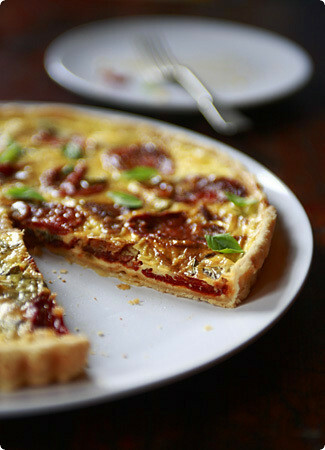 The tart looks gorgeous – we have some beautiful tomatoes growing in our garden which I will endeavour to use. Thanks for the reminder! Hey Melissa,That tart looks amazing! And so does your new home! There is actually a great tomato stall at the farmers’ market which always has a long queue. I’ll have to check next time I’m there, but I’m pretty sure they come from a Scottish farm and not from down south. Kitt – Luckily they do have plenty of canned Italian tomatoes in Scotland, thank heavens – without them I probably never would have survived!Lisa Marie – Now you tell me! It always happens that way, doesn’t it – as soon as you move away from somewhere you learn about all kinds of great places you never knew were there. Sigh…cmoore – Oh, I know the feeling well. The only problem is going back to the old tasteless stuff after having such a revelation, isn’t it?Robin – Yikes, that is a fitting description!Brendan and HH – Okay, okay, you got me. Whisky it is. Well done on the tomatoes, btw. Did they taste anything like they should?La Traductora – Surprisingly yes, there were plenty of hot peppers available in Scotland (though not grown locally, of course). In general south Asian and Caribbean ingredients are easy to find all over the UK because of the large immigrant populations. So at least on that count I couldn’t complain. :)Rachel – Welcome! And wow, good memory. :)Helen – Oooh, now why did we never get any of those good English tomatoes up north? I think it must be a Dutch tomato mafia controlling the supply lines or something…Yasmin – It is funny how that happens, isn’t it? And I feel it happening in reverse now – I’m missing things from Scotland that I completely took for granted when I was there!Melissa – How cool, that should be a fabulous spot for a wedding! And I’d imagine there should be enough excellent seafood to distract everyone from the absence of any tomatoes… :)Dharshi – Wow, they must be new! Or else their season is so short I just missed it entirely in previous years. 😉 p.s. How are you guys? Hello! Welcome to the states! I’m going to make this fantastic tart for a lunch party. How long can it sit? If if comes out of the oven at 9 a.m. will it be OK at noon if I leave it at room temperature? Also, did you try baking it a day in advance? Do you think that would work? Or would the crust get soggy? Sally – It should be fine baked either a few hours ahead or a day in advance. I baked it in the morning, and we ate it for dinner two nights in a row without any sogginess problems. To be on the safe side, though, when you take the hot crust out of the oven you can seal it by brushing it with lightly beaten egg white. Let me know how you like it! p.s. Oh, and if you’re only leaving it for a few hours I’d say it’s fine to leave it at room temp, but overnight I’d probably recommend chilling and reheating. Probably the only thing my husband’s sister and I ever truly agreed on was the lamentable pallor of British tomatoes. But really, of course, it is all about the inferiority of all tomatoes which are grown with insufficient sunshine, picked unripe and/or transported in a refrigerated state. Almost any climate in the continental US permits the growing of tomatoes at home, or same-day farmers’ market tomatoes. Anything else, including US supermarket tomatoes labeled "locally grown" is just sad.Lucky for us all canned tomatoes can provide an excellent substitute ingredient in many dishes when a good fresh one cannot be found. This was my first time to your site, and as I was scrolling down I came across the Tamato Tart photo…. Instantly my taste buds went on point and my mouth started watering. One of my favorite things to eat is tomatoes and this made want to go raid my garden and start cooking right now! Can’t wait to try it. I am a bit sad… being Dutch seems to be a bad thing tomato-wise :-(We do have great tomatoes here, tasty, yummy ones, You can buy them at markets, and even some bigger stores have tomatoeswho smell delicious, and taste even better! But i agree that they one we export are not the best, I think it has to do with the time they need to travel?Love the recipe, will try it for sure! Just like another reader this is my first time to your site. I love to travel and eat. I too love tomatoes and basil. Your tart photo and description made my mouth water. Thanks..I’ll try it. Tamasin Day-Lewis’s tart book is great. You should also check out a book called Once Upon a Tart; they have a couple great tomato tart recipes as well as some really good soups and baked goods.Cheers! I have so enjoyed browsing through your blog this morning! I visited a while back but see that I have been missing out. This tart sounds delicious. Tomatoes and tarts are probably two of my favorite things…I just haven’t ever combined them.I have soft spots in my heart for the UK and the Northwest (both places I’ve been able to call home), so it’s always nice to find a blogger who relates to that (and the experience of lacking good tomatoes on the isle of GB! ).I look forward to coming back. Good informative site, will you be expanding it now that more & more people are growing their own tomatoes to overcome those nasty supermarket things you describe?